Popular for warehouse offices and commercial applications. 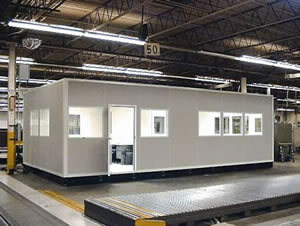 Modular Office buildings offer a clean, quiet, and safe environment for industrial warehouses and professionals. 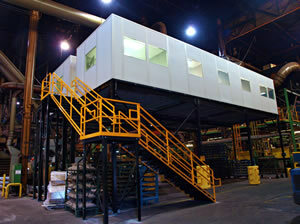 An In-Plant Office can be added on top of a mezzanine. It will add more floor space and still have an office that can oversee facility activity. 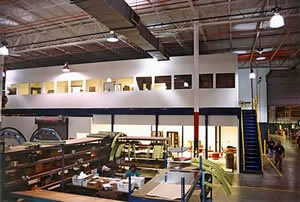 The mezzanine can meet your many office configuration and specifications using structural steel. Instead of building out, you can increase your space by building up. The raised office structure for staff members adds sufficient space underneath; freeing up additional space for other uses such and racking, service bays, and more. Pre-fabricated structures provide a durable and attractive building that is ideal for most modular and industrial applications. 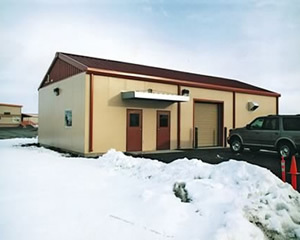 The Exterior pre-fabricated building are the fastest way to add space. 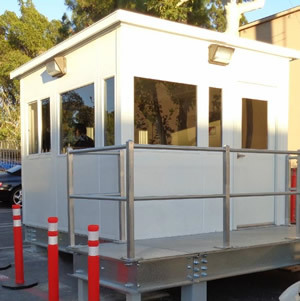 The pre-assembled small buildings and guard shacks were designed to be handled by a crane or forklift for easy and quick placement. Call NationWide Shelving for stock models and fast ship times! 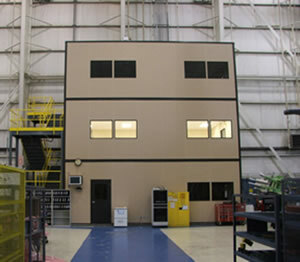 Utilizes your vertical space by adding a two or three story modular in-plant office. Custom powder coated stair systems can be installed to access upper levels. Made to order options are available. Our highly trained staff can customer help you design and draw a modular office, mezzanine and pre-fabricated structures to fit your needs. The panels are pre-coated aluminum and are resistant to abrasions but easily cleaned. For a seamless appearance we recommend the vinyl covered gypsum panels with powder coated binder posts. If your need a building system fast, then a pre-assembled building would a great option. 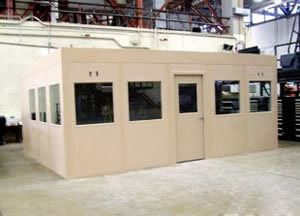 These buildings were designed for industrial, commercial or military applications to maximize space. They can be shipped assembled from the factory to your site and are ready to go! To the left you can see a 8'x16' guard booth. 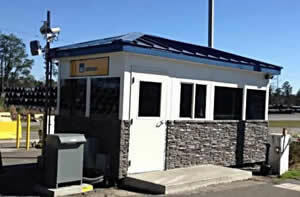 You can see a stone siding with white steel panels and customer blue roof. It has full HVAC system and tinted windows. 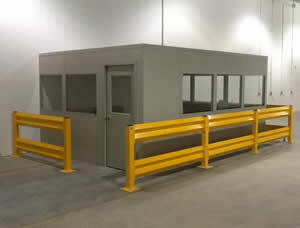 This provides a safe and comfortable environment for the security officer to protect the perimeter. Value Line Modular Office in 2 Business Days! 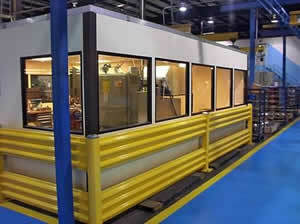 For off-site office needs a modular shipping office can provide a fast, reliable, and secure structure. A Modular office can provide you and your workers an on-site office at a construction site that is also a safe place to work in. 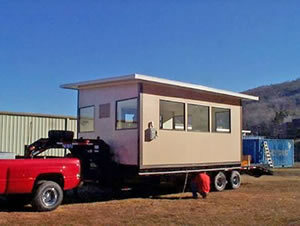 We can offer customized modular offices with a fast delivery wherever you need it. 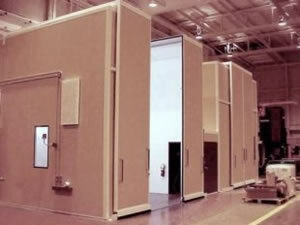 The “Sandwich” panels were specially designed for one hour fire modular buildings. 5/8” Fire-Shield gypsum board with a mineral wool insulated core and held in place with 26 gauge galvanized steel studs. 20 gauge steel channel is used to secure the wall panels. We understand the unique requirement every clean room may have. We offer many options to accommodate a variety of wall systems and air systems to meet your specific specifications. Options available up to class 1,000. Our experts are highly trained to assist you in the design, purchase and installation of your clean room. 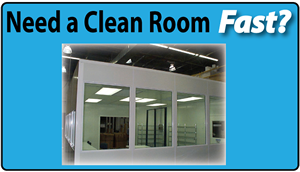 These turn-key modular clean room system are some of the best in our industry. Barrier Rails are used for protection for such equipment as: inventory areas, in-plant offices, loading docks, conveyors, electrical equipment and any space that requires extra protection. The rails are made of a tough 11 gauge steel which can withstand sever impacts. They are available in single or double rails and finished with powder coating.